3 Bedroom Terraced House For Sale in Luton for Guide Price £230,000. 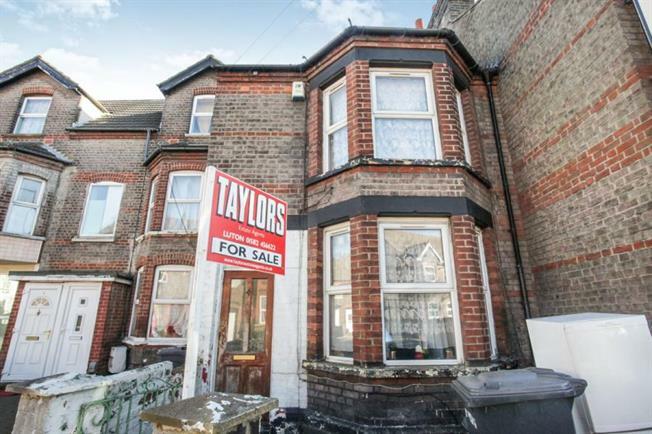 Fantastic potential and offered chain free is this larger than average three double bedroom terraced property that would make a large family home/two sizeable apartments or even hmo investment. This spacious property comprises of an entrance hall, bay window lounge, separate dining room, kitchen/breakfast room, three large bedrooms, family bathroom and front and rear gardens. The property's location boasts excellent access to local shops including Sainsbury's and Lidl, Bury park parade is on the doorstep as well as great schools. Central black cast iron fire place, Upvc double glazed bay window to the front, double radiator. Upvc double glazed window to the rear, door to the kitchen, double radiator. Fitted with a matching range of floor mounted units, inset stainless steel, single bowl single drainer sink with mono block taps, in to roll fronted worktop, space for oven, fridge freezer, and plumbing for washing machine, part ceramic tiled walls, window to the side, access to the side. Window to side, double radiator. Bay window to front, double radiator. Comprising deep panelled bath with shower over, pedestal wash hand basin and low-level WC, single radiator, and part ceramic tiled walls. Enclosed and secluded, laid mainly patio, access to the side entrance.